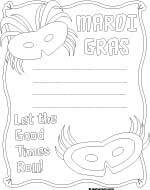 Printable Mardi Gras Pictures to Color - celebrate Fat Tuesday, let the good times roll with Mardi Gras coloring sheets - Carnivale jesters, masquerade masks, Indian head dress, King crown and Mardi Gras posters to color. Even if you can't travel to New Orleans for the big pre-lenten party on Fat Tuesday, you can make your own party fun with these Mardi Gras coloring printables. You can also find masquerade masks to color in our Halloween coloring section.